It was a Friday night to forget for the Olentangy Liberty football team, which was outscored 21-0 in both halves on the way to a 42-0 non-league loss to visiting Pickerington North in Powell. Pickerington North quarterback Jimmy Weirick hit Jaylon Baylor for a four-yard touchdown strike with 10:10 left in the opening quarter to give his team the only points it would need. Nonso Uba ran for a five-yard touchdown later in the quarter and Tyler Potts picked off Liberty (3-2) QB Mitchell Okuley and returned it for a touchdown with a minute left in the first to make it a 21-0 game. Three second-half TDs, including another pick six, smoothed out the scoring summary. The Pioneers scored 29 first quarter points and never looked back en route to a lopsided win to wrap up non-league play Friday in Lewis Center. Jayden Rodgers set the tone, taking the opening kickoff 86 yards for a touchdown. Graham Starn added a 12-yard first quarter touchdown run and Jack Applegate found the end zone twice before the quarter came to a close. Orange (5-0) scored three more touchdowns in the second — a 19-yard run by Starn, a three-yard run by Applegate and a two-yard scamper by Brian Watson — to pretty much end things by halftime. Starn finished with 58 rushing yards to go with his two touchdowns while Applegate had 57 yards to complement his three scores. Jack Neer had an interception and a sack to lead the Pioneer defense. 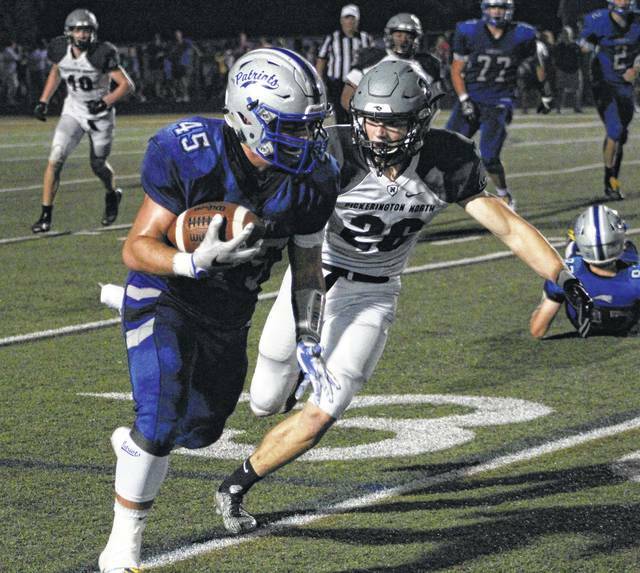 Nathan Lawyer scored on a 43-yard run late in the third, but the damage was already done as the host Wildcats parlayed a 34-0 halftime lead into a lopsided non-league win Friday in Westerville. Matt Priestas found the end zone from four yards out early in the fourth to round out the Big Walnut (0-5) scoring summary. Sloan Bowman booted a 33-yard field goal as time expired to lead the Colts to a thrilling MOAC win over the visiting Barons Friday night in Bellville. Clear Fork improved to 5-0 for the first time since 1999 while Buckeye Valley fell to 3-2 overall and 1-1 in league play. Grant Owens tossed two touchdown passes, the first a 58-yard strike to Joey Verdes to give the Barons a 7-0 lead they maintained until halftime. Also: Olentangy 21, Marysville 14. Pickerington North’s Ben Johnson (26) tracks down Liberty’s Matt Webb during the second half of Friday’s non-league battle in Powell.